If you’re considering a dental implant as a replacement for a lost tooth, you’re looking at a restoration method with an amazing 95% success rate after ten years. But that being said there’s still a risk, albeit quite low, the implant might fail. And if you smoke, the risk is slightly higher. In a recent study of implant patients, twice as many of the failures occurred in smokers compared to non-smokers. 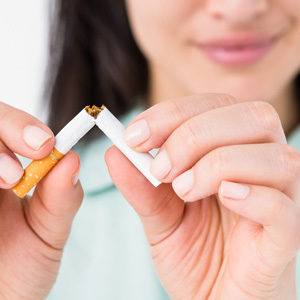 If you’re a smoker, you can increase your chances of a successful outcome if you quit the habit. Nicotine, a chemical within tobacco, is the primary cause for this higher risk. Besides its effect on the pleasure centers of the brain, nicotine also restricts smaller blood vessels that are abundant in the mouth and skin, causing less blood flow. As a result, the mouth doesn’t have as many antibodies and other substances available to fight infection and help traumatized tissues heal. Because of this, as well as reduced saliva flow due to the habit, smokers have an increased risk of dental disease and are slower to respond to treatment. This can be especially problematic if the gum tissues around an implant become infected, which could lead to a catastrophic failure. Slower healing also impacts the post-surgery period when bone cells in the jaw are growing and adhering to the implant surface, forming a stronger bond. To avoid these potential risks you should stop smoking before you undergo implant surgery. If you can’t completely kick the habit, you should at least stop a week before surgery and for two weeks after. It’s also critical that you practice good oral hygiene — both brushing and flossing — to minimize the occurrence of dental disease and see us for regular checkups and maintenance appointments. Taking these steps will greatly increase your chances of being in the vast majority of people who continue to enjoy success with their implants for many years.